The open-source syringe pump was designed by Wijnen et. al. (2014). The design, bill of materials and assembly instructions are freely available and details are provided covering the construction - using a 3-D printer and a Raspberry Pi computer as a wireless control device. According to the authors, the costs, including the controller and web-based control interface but without labour costs, are <5% of a commercially available syringe pump of similar performance. 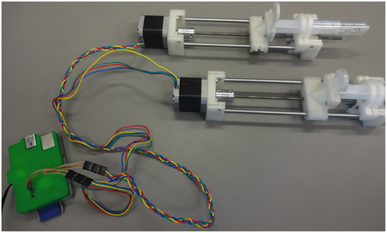 The performance of the syringe pump, as assessed by the authors, should suit the needs of a given research activity requiring a syringe pump including carefully controlled dosing of reagents, pharmaceuticals, and delivery of viscous 3-D printer media among other applications. Files: All files needed to construct the device are available at https://github.com/mtu-most/linear actuator. Please get in contact if you need any help building this versatile open hardware syringe pump.